UK Biobank of the Year Award 2019 - Enter now! We're pleased to announce that applications for UK Biobank of the Year 2019 are now open! Now in it's 4th year, the award recognises human sample resources who have added significant value to high impact research. The winner of the award will be announced in November at the 2019 UK Biobanking Showcase event. Do you work at a human tissue resource (HTR; for example, biobanks, biorepositories, cohort studies, clinical trials; etc.)? If so, nominate yourself for the award by submitting up to two research case studies that detail how your work has enabled high quality research. The selection panel choosing the winner and honourable mention will consist of members of the UKCRC TDCC Steering Committee. What information should my research case study include? The case studies should detail the most impactful research outcomes (for example publications or results) from researchers using the samples and data supplied by the resource. The case studies should be developed with the researcher, and the details of the researcher should be specified in the application. Submit the case studies in the form of a conference poster (details in the application form below). Interested in applying but not sure where to start? The Avon Longitudinal Study of Parents and Children (ALSPAC) won last year. This resource follows cohorts of parents and children in the Bristol area. The judging panel were impressed by the wealth of associated data along with the outstanding engagement work performed by this resource. Click on the poster preview below to see their entry. 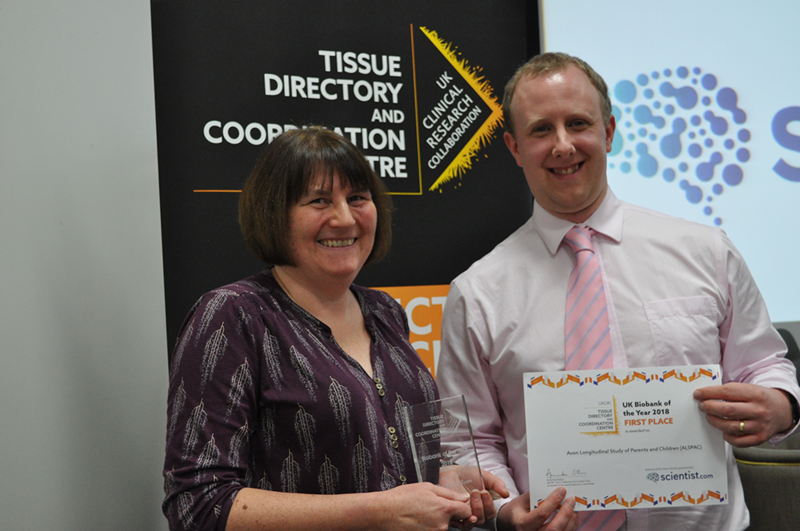 The UK ME/CFS Biobank received an honourable mention as runner up. This biobank, based at LSHTM, works with ME/CSF patients across the country. Although this resource has only been in operation since 2011, they were able to demonstrate significant research value and excellent patient engagement with the community. Click on the poster preview below to see their entry. Is there anything else I should do to apply? The deadline for applications is 10th October 2019. Only fully UKCRC Tissue Directory-registered human sample resources are eligible to apply. This means your HTR has a profile, and a collection and/or capability appearing in the main search. Shortlisted candidates are expected to attend the event. If you have any questions regarding the application, please get in touch.